This is a great challenge. No paper at all? I think that will be very difficult. Especially for homework. I am so curious to see how you adapt to this change and if anything that you try will become a part of how you teach going forward. I wonder if there is an equal challenge for our students? Maybe having to do with lunch and snacks? I wonder if you were to measure the 'waste' on a regular day: brown paper bags, plastic baggies, disposable water bottles and then challenge students on earthday to reduce, reuse and recycle, if we can reduce our waste. Reusable lunch sacks/lunch boxes, reusable containers for the items inside, canteens and sports bottles. Do you think we are up for the challenge? Good luck with a paperless classroom! Yes, no paper at all! I'm going to be using online sites for the spelling, grammar, and math homework. In class, we will be using whiteboards. It will be a real challenge! I really like your thinking about the paper used for snacks and lunch. That will be a topic we will discuss when we get back at school next Monday. Thanks for pointing that out! I also think this is a great challenge. 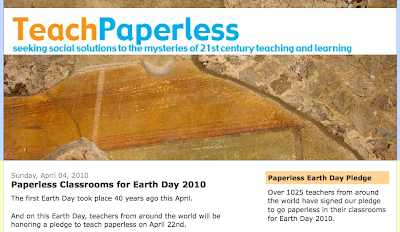 In fact, I just signed the pledge to have a paperless classroom on Earth Day as well! In the past I have done days where each student gets just one piece of paper, but going completely paperless is even better. The whiteboards will get a lot of work on Earth Day, I hope the erasers are up for it. Last year we followed The Great Turtle Race through National Geographic, but I'm not sure they are doing it this year. I'm so glad you signed up! It sure sounds like a great project. We have a couple of tests scheduled for that day, so we will be taking them online using Quia. That is a new program for me (and my students) so it will be exciting to try something new. Yes, let's definitely Skype about the day! Great idea! It will be interesting to hear about their impressions of the experience! I think that this is a great idea to do! It might be very hard though because my class usually usea a lot of paper during the day of rall of our schoolwork, but maybe you can do it with ease! I think this challenge is a very good idea because the enviroment is important.But I think it's going to be very hard with no paper.I also just found out that our teacher signed our class up for that challenge too! Thank you for visiting our blog and for leaving a well-written comment. We got several comment this morning from students. Maybe all of the commenters are from the same class! It will be difficult to try and have a school day without paper. We'll let you know how it goes! Thank you as well for visiting and for such a thoughtful comment. Yes, it is going to be difficult and strange to have a paperless day. Perhaps we'll keep track the day before to see how much we use on an average day...and then we could use that number to figure out the total for an average week and so forth. I'll be interested to hear how it goes for your class! 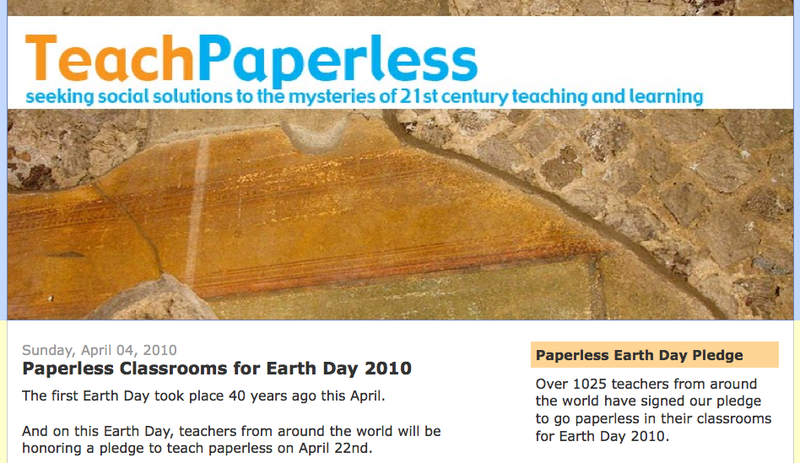 Mrs Yollis and Class - I think that the paperless challenge is GREAT, I do think that as teachers that we are responsible directly and indirectly for using a huge amount of paper. It would be challenging to not use any for a day but I think that you will be creative and come up with ways around it. I think also measuring waste like Jaxon's Mum said is a great idea, we are always trying to do this to reduce waste at our school like recycling paper and recycling left over food. the paper challenge sounds very interesting and very challenging. I recken it would be very hard to do but you can do it but I know you can do it!!! how wonderful is this challenge and what a challenge it will be. I do have my own challenge in place here as when Bianca goes to school I make her lunch and use reusable containers and a reusable drinking bottle which she brings home. Good luck with your challenge I will be reading with great interest from down under AA. I think it is a great program as well and am really looking forward to making some lasting changes in my classroom through the experience. The waste produced at snack and lunch was something I hadn't considered. I loved when Jaxon's mom mentioned the idea of weighing it and then looking for ways to be less wasteful. Super idea! 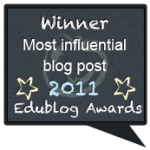 Isn't blogging wonderful! Good ideas get out there and everyone can benefit! It will be interesting to learn about how your day goes with your students! Yes, I think it will be very difficult, especially for me! I must confess, I use a lot of paper every day and to go to ZERO will be difficult. I think some new ways of thinking/learning will be developed. It is going to be a huge challenge, but well worth it. Reusable containers and drinking bottles are the way to go, so maybe this will influence more parents to be less wasteful. We'll see! I was one parent who never really thought about how wasteful I was until we got two recycle bins. We have one small house hold rubbish bin and one recycle bin and one green waste bin where we place our lawn and tree clippings into. We also took part in earth hour just last week. That is where we switched off all our lights in our home for one hour. It is becoming very popular as alot of countries are doing it as well which is great!! All the best from AA. ps A BIG happy birthday to your mum too!! http://rpdc.mst.edu (you'll find me under technology). I think your choice to become a paperless classroom is a SMART idea. You might want to check out this website, it's a fund raising project to turn trash into school supplies. 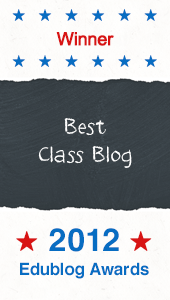 Thanks for your kind words about our blog! We certainly enjoy it when people take the time to comment. Yes, I think the paperless classroom is a smart idea. Just last year, I used to xerox papers for my classroom and leave one side blank! This year, at least I've made some progress and always use both sides. Using NO paper will be a real challenge, but I think it will open up new alternatives that we haven't considered yet! We're excited! No paper! I love it. You and your class inspire me--I'm going to follow your lead and eliminate my paper trail on the 22nd...and work on ways of reducing it going forward. Can't wait to read or watch the video clips on how you made it paperless!! 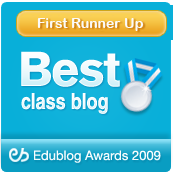 Congratulations on an awesome blog! 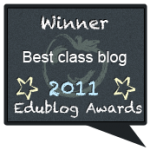 If you don't mind, I will add you to our class blog's blogroll to share with them once they are back from holiday next week.We were also doing the blogging challenge but lost our way a little - our first term was only 8 and a 1/2 weeks with a week camp thrown into the mix.We will try to catch up next week! As for your post about Earth Day - I really enjoyed it and will read it with the class on Monday and add to your Wall Wisher with the children. Your post has given me something to share with them. They already use some of the resources you suggest but I think they will also enjoy exploring some of the other web 2 tools! I love the post about the blog challenge because it is interesting how everyone that has a blog can join. 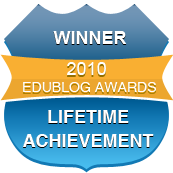 It is a good program for a lot of students as well teachers to learn.If I had a blog I would be delighted to join.